When we have young adults for sale, these are not dogs we could not sell. These are the dogs we selected for ourselves to continue our breeding program. We always keep more than we need, often two males & two females out of a litter and then as they get older we decide which of the two we will keep to continue to include in our future breeding program. Often this decision is based on the most subtle differences in the two dogs and often is based on some trait we were specifically trying to improve with this breeding, such as eye shape or coat texture, etc. From time to time we have retired adult dogs available for a approved pet home. The same application process is required for our adult dogs as with our puppies. The adult dogs are all sold as pets and are not available for breeding or showing. If you are interested in any of the dogs posted here please either give us a call or submit a inqury on the contact us form. Krystal is a 3 year old female that is now retired and looking for a ​​​​​​approved pet home only. She has a wonderful temperament and is ready to have her own family to love! 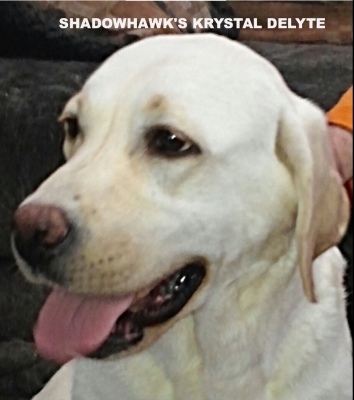 Krystal is crate trained, house trained, leash trained and has basic obedience training. She does well with other dogs and will make a wonderful pet companion. She is current with her vaccines and up to date on wellness exams, and is microchiped. If you would like to see Krystal's pedigree click on the link below.